True story: my sister in law kept telling me that she made this dish off my blog all the time and I had no idea which pasta dish she was referring to. It is a pasta we used to make all the time until one day we didn’t. So I looked it up, gave it a new photo and am happily adding it back into the rotation. It’s super simple but fresh tasting, flavorful and adaptable to taste. It is tomato-based making it widely appealing and you can add more or less kale and crushed red pepper according to your or your family’s tastes. Plus, chickpeas! Can’t recommend chickpeas mixed with pasta highly enough! They absorb the sauce flavors, are super tasty and add nutrients like protein, fiber and a whole host of vitamins. The details… It starts with the Italian classics — lots of garlic, whole peeled Italian tomatoes, basil and crushed red pepper and simmers at least 25-30 minutes or until you’re ready to eat. You can make it as spicy as you and your family desires — my family is mixed on spiciness so we make the sauce on the less spicy side and my husband and I add extra crushed red pepper to our bowls. 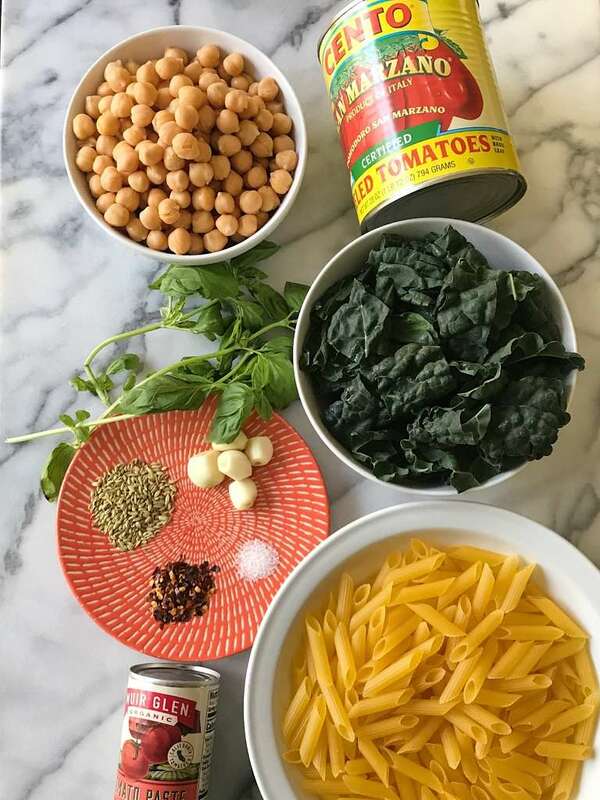 When ready to eat, we cook the pasta and add fresh kale and chickpeas to the sauce for extra flavor, texture and nutrients. The cooked pasta then gets added directly to the sauce and cooked together for a few minutes so it too absorbs the sauce flavors. Top with fresh basil and parmesan cheese and that’s it… in 45-minutes or so- You have a fresh, hearty and super flavorful dinner! As you can see by how we assemble this dish, it lends itself well to prepping ahead of time or making all at once. But if know you’re going to be busy prior to dinnertime, you can make the sauce and prep the kale whenever you have time, then just cook the pasta and add the kale and chickpeas to the sauce when you’re ready to eat. This simple pasta dish is fresh tasting, flavorful and adaptable to tastes. It's tomato based making it widely appealing and you can add more or less kale and crushed red pepper to tastes. In a large saucepan or deep skillet, heat olive oil over low heat. Add garlic and sauté, stirring occasionally, until very fragrant, not browned, about 1-2 minutes. Add tomatoes, red pepper, and a generous pinch of salt. Stir in well, gently crushing the whole tomatoes with the back of a cooking spoon. Cook over moderately low heat, stirring occasionally for about 15 minutes. Add in tomato paste and mix in well. Continue to simmer about 10 minutes or so until the tomatoes break down and sauce thickens. Cook pasta according to package. Before draining pasta, reserve a cup of pasta water. 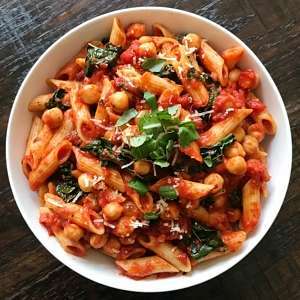 Stir chickpeas and kale into sauce and continue cooking over moderately low heat, stirring occasionally while pasta cooks (approximately 7-10 minutes). If sauce seems too thick, add a spoonful or two of pasta water. Add prepared pasta into sauce and gently mix. Add reserved pasta water as needed and continue to mix and cook an additional minute. Serve into bowls and top with basil and grated pecorino or parmesan.